A mystery from 1955. I was lucky enough to purchase quite cheaply a Cunard line program of events signed by Ian Fleming. This is dated Oct 21st 1955. 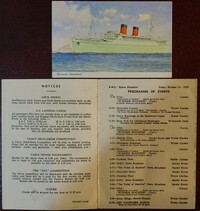 Along with this came a signed note on Cunard paper from Errol Flynn and a postcard of the Cunard liner, The Mauritania. Initially I put 2 + 2 together and came up with 5. Both Errol Flynn and Fleming had nearby houses on the North Shore of Jamaica and knew each other. The Mauritania stopped at Jamaica so its easy to imagine the 2 of them on the same trip. Closer examination however proved things were not so simple. The month (October) however did not seem right - Fleming spent January and February in Jamaica each year when he wrote his books. 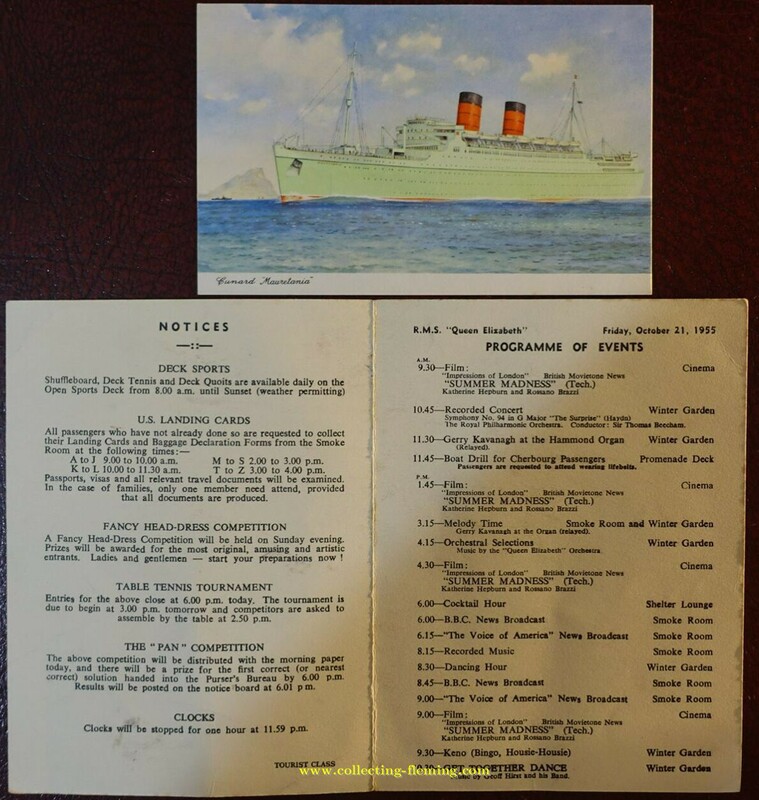 I then looked at the program properly and unlike the other 2 items the program is from the RMS Queen Elizabeth not the Mauritania. From the text it mentions Cherbourg and US landing cards so the program is probably from the Southampton / Cherbourg to New York service. The common thread between the three items is now Cunard liners so its possible they were all from someone who worked on-board the ships. Whilst in Jamaica in early 1955 Fleming wrote the draft of Diamonds Are Forever and in the manuscript Bond and Tiffany Case travel back from the US to UK on board the Queen Mary. 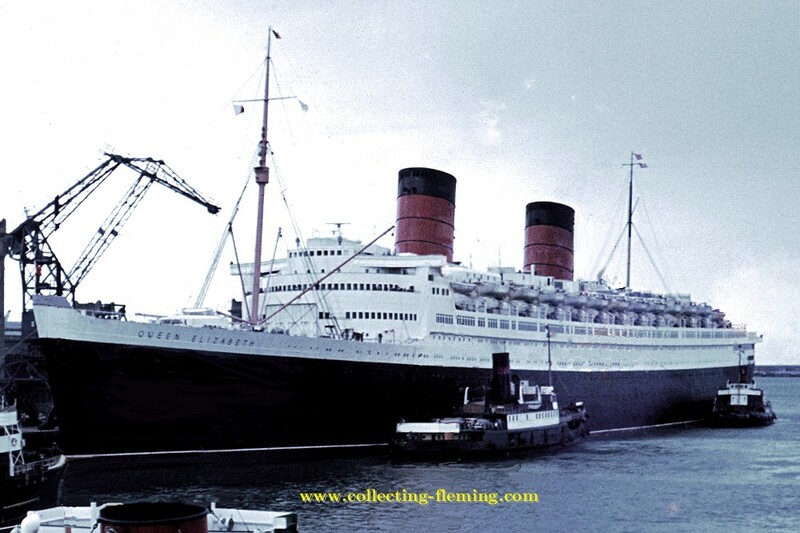 The book was not published until 1956 and by this time the Queen Mary had been changed to The Queen Elizabeth. Either Fleming was travelling on the Queen Elizabeth knowing it featured in his soon to be published book or perhaps it was during this trip he decided to change which ship Bond traveled on? 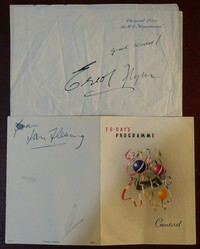 Some great details and photos about Fleming and The Queen Elizabeth can be found on the Fleming’s Bond web site. By 1958 the first non stop passenger jets were flying across the Atlantic and the days of the great passenger liners were numbered. In 1968 the Queen Elizabeth was sold to a group of American Businessmen who planned to use it as a hotel. This venture failed and it was sold again at auction to a tycoon from Hong Kong who planned to convert it into a floating university (source). Now called the “Seawise University” the ship was destroyed in a suspicious fire in 1972. 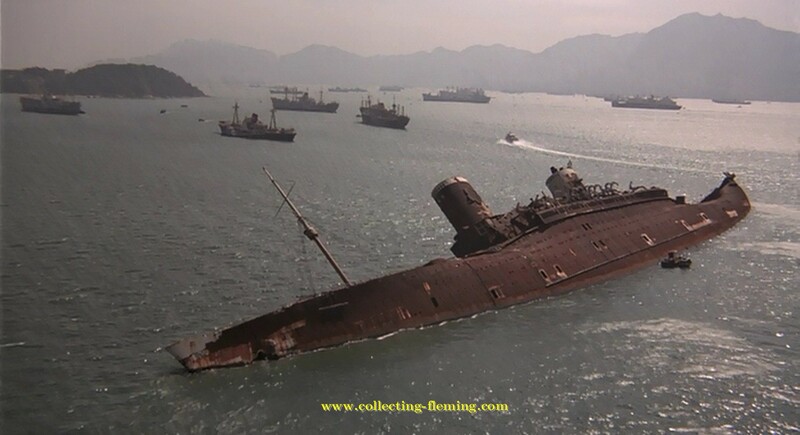 Nealy 20 years after Fleming’s trip in the Queen Elizabeth the rusting, capsized wreck in Hong Kong Harbor still had one more role to play in the world of James Bond. It was used during the filming of The Man With The Golden Gun as the Hong Kong headquarters of MI6.